To some, Tahnee Camilleri had it made. She was young, a lawyer in Australia, was making a good living. But she didn’t want to be a lawyer. She wanted to be a trainer. And she didn’t want to be a trainer in Australia or New Zealand, but in the U.S. So, last spring she embarked on what seemed like a foolhardy adventure. She packed away her diplomas in a box, moved to the U.S. and decided she would train standardbreds, starting from scratch, knowing almost no one. “Really, this is my passion and I can always go back to the law if it doesn’t work out,” she said. The law is going to have to wait. Entering Wednesday, Camilleri, 32, had won 16 of 33 starts since establishing her stable, which races primarily at the Meadowlands and Yonkers. Her stable currently numbers just five horses, but another is on its way. All have been imported from her native Australia. The star is Constntlysidewys, who is 4 for 10 and has won at the preferred level at the Meadowlands. 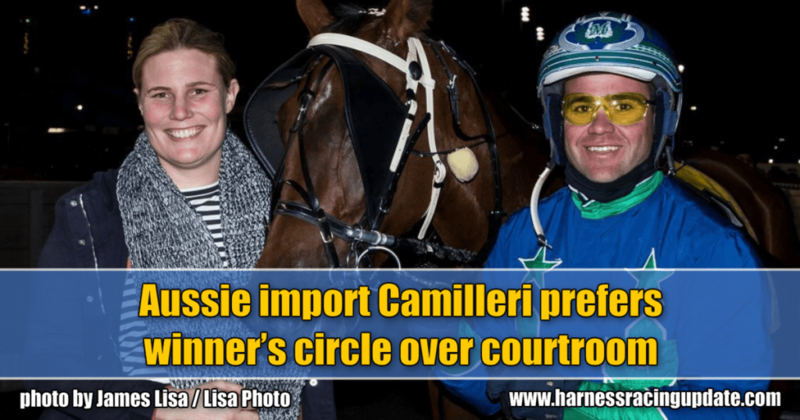 Camilleri did not grow up in a racing family, but says she always loved horses and had to give up her riding horse when she was 15 and her family moved from the country to city, where there was no place to keep the horse. Over the next several years she juggled her education with her penchant for the horses. She became a groom and would often travel with horses when they shipped out of state. A trainer named Stuart Hunter wanted to send some horses to the U.S. and asked if she would go over there and train them. She agreed, and took a sabbatical from law school. She arrived in 2009 and stayed for little over a year. With a trainer’s license of her own for the first time, she won just two of 34 starts. But she had fallen in love with U.S. harness racing. She earned her law degree and practiced law for nearly five years. She knew fairly quickly that it wasn’t for her. With her Australian roots, she has been able to pick out horses that she knows can win in the U.S. She has an agent working for her in Australia and he recommends horses. Thus far, Camilleri has no outside owners and no employees. She wants to continue to build her stable with ‘Down Under’ horses and part of her plan is to sell some of the ones she has brought over at a profit so that she has more money to reinvest in her stable. If she keeps winning and keeps adding to her stable she believes it’s only a matter of time before outside owners come to her. She said she will continue to build her stable with imports, but sees the day when she has clients who will give her the money to go out and buy young American-bred horses. There may still be some who believe it is foolish to give up a solid living as a lawyer, move half way across the world and try to build a harness racing stable. Those same parents who once, in her words, “would have killed me” had she not returned to law school are not among them. They’re happy their daughter is happy.